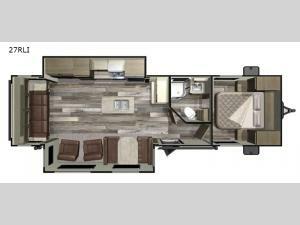 If you're looking for a cozy, convenient, and stylish travel trailer then this Starcraft Mossy Oak 27RLI is perfect for you! The kitchen island allows you to move freely around with extra counter space to whip up your best meals. The lounge chairs and the sofa with end tables on either side create the perfect space for you to entertain your camping neighbors. You can also enjoy socializing outdoors underneath the electric awning. If you want to play some late night games just turn on the LED lights and enjoy your favorite tunes with the outdoor speakers too. The front private bedroom has a comfortable queen bed with nightstands and closets on either side to keep things tidy. Plus, you even have your own entrance into the dual entry bath!